Vince Cable, the Secretary of State for Business, gave a speech in Brussels the other day and took digital by default one step further: right across Europe. He was talking about a policy paper called the UK vision for the EU's digital economy. I urge you to take a good look at this one. It calls for a single digital marketplace for the EU, for digital public services for EU citizens, for open data and for sensible legislation and regulation. 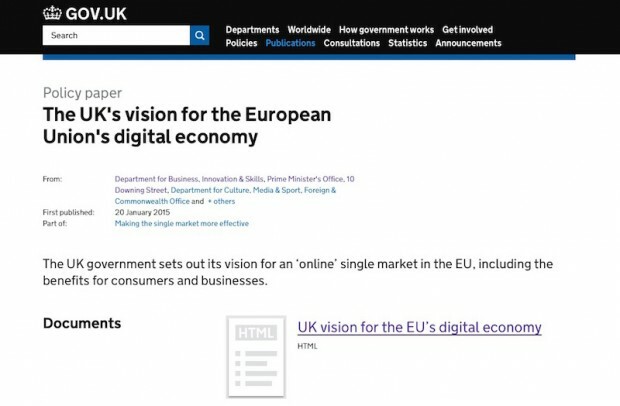 Our vision for the digital single market is one which is digital by default, where it is even easier to operate online across Europe than it is to do things offline in a single state. Where online businesses go through administrative processes once, not 28 times, and where football fans can stream matches they’ve already paid for wherever they go. This is great stuff. It’s a glimpse of the future. It advocates radical change; not change for the sake of it, but change that's necessary to push the entire EU economy into the modern era. Governments aren't usually very good at drastic, rapid change, but they need to be. The internet is changing the world around them, and if governments don't adapt they will find themselves irrelevant, impotent, and ignored. I wholeheartedly support this vision, and encourage the EU authorities to consider its suggestions (and implications) very carefully. This is clearly where the internet and digital technologies are taking us, all of us: people, businesses and governments alike. People and the businesses will adapt - they've already started. Governments cannot afford to drag their heels.